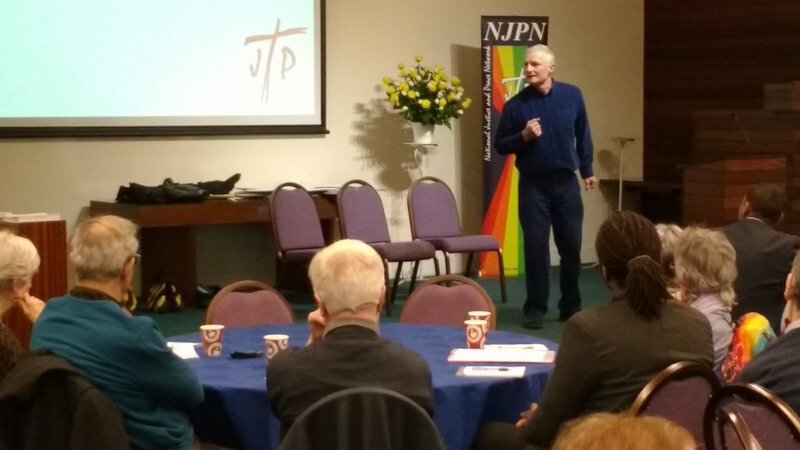 Not only was this event a Leeds J&P Conference, it was also the place where we launched our Annual Review for 2016 and, on top of that, it was also an Open Networking Day of the National Justice & Peace Network (NJPN). 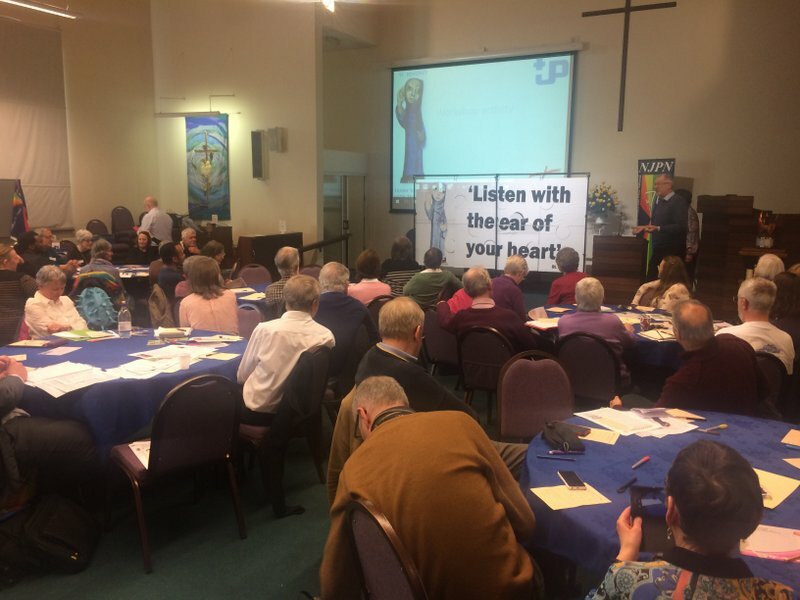 As a result, not only were there people from across the Diocese, there were also people attending from across the country including Middlesbrough, Hallam, Liverpool, Birmingham, Plymouth and London dioceses. The day was unusual in another respect. 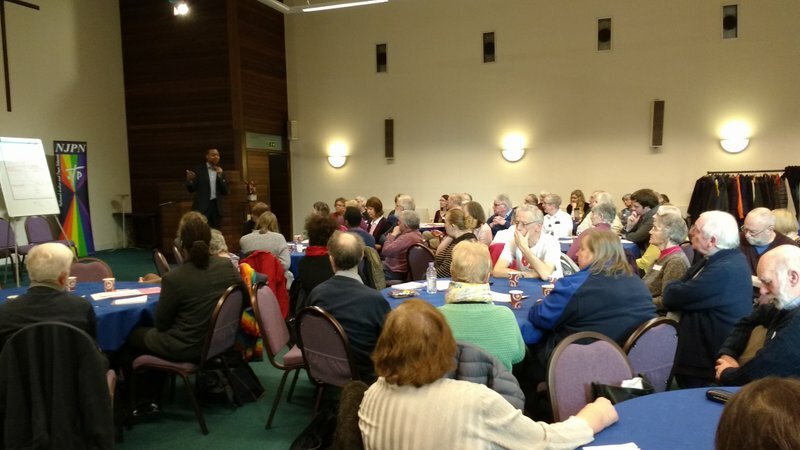 In the last couple of years we have focussed our conferences on particular issues: The use of foodbanks, the Israeli Separation Barrier and so on. 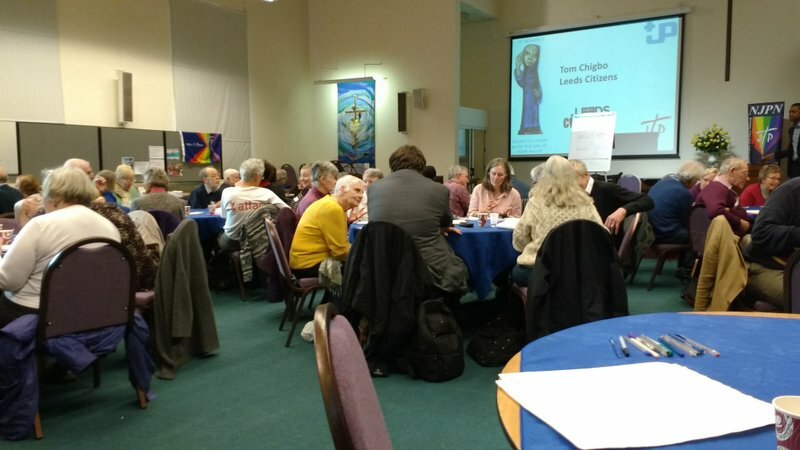 It is nearly a year since we helped the Las Casas Institute of Oxford University organise a conference about being ‘a church of the poor’ and what this might mean in 21st century UK. Given the febrile atmosphere in post-referendum UK and the election of Trump as US President we thought it was important to give time for us to reflect on who we listen to and how we listen. This resulted in a rather different way of organising the day. In the morning local actor Roger Harington provided the longest ‘input’ of the day by performing a solo piece of thought-provoking drama that covered all sorts of aspects of listening badly – but done in Roger’s usual very humorous style. 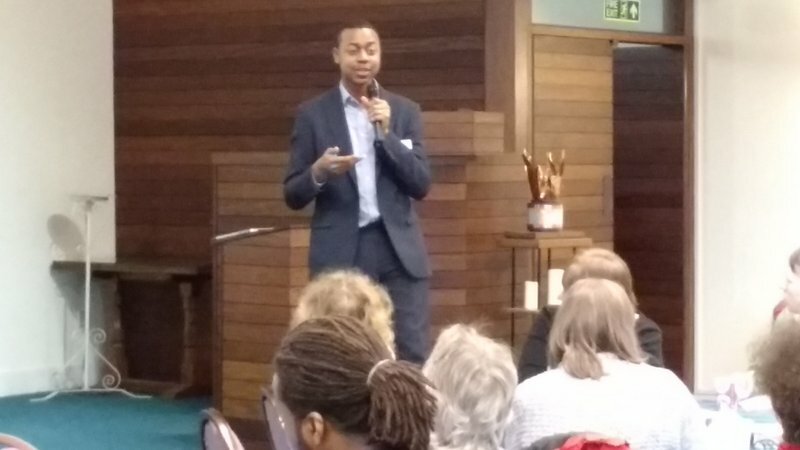 Most of the morning was led by Tom Chigbo, the organiser for Leeds Citizens. He introduced people to the power of a key techniques used by Citizens Organising: the 1:1. It involves sitting down and talking to another person! However, the power of it comes from what you discuss. It is about spending time understanding what it is that the other person is passionate about and what are the triggers that will make them do something. So it is not a quick chat over a cup of tea after Mass, or catching someone at the end of a meeting. Neither is is trying to sell something to someone (getting them to do something) nor is it meant to be therapy. It is a deliberate arrangement to sit down with somebody to understand them better and for them to understand you better. If you spend half an hour doing that then both of you are in a better position to understand the sorts of action that each of you might be interested to undertake. Shortly after he moved to Leeds Tom was asked at Church one week if he would be interested in working with young people in the parish. He had no interest in doing this so he said ‘No’. We are all busy people but often we make too many assumptions (young person interested in Church – must be interested in working with young people). We don’t take the time to get to know people properly and in the process we can easily miss the opportunity to involve people in something about which they are passionate. The energy generated in the room during these exercises was palpable – so much so that five minutes after the conference broke for a shared lunch the tables were still half full of people. Roger Harington Listens badly in a frenetically-paced piece of drama about listening. Table groups getting stuck into their tasks. 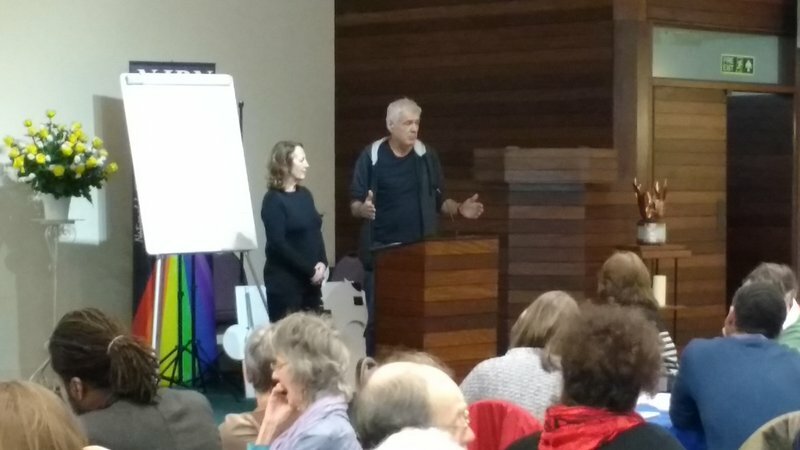 The afternoon session was introduced by Mike Love and Mary of the Leeds Poverty Truth Commission. They talked briefly about different levels of listening and the different results that can ensue. The main part of the afternoon was spent in small groups in more traditional style, considering some questions about who we listen to and what we think good listening is like. Each of the tables in the room had a card in the shape of a giant piece of a jigsaw puzzle. People wrote down key points from their discussion on the pieces of card. At the end we took a little time for each group to say their key points before putting their piece of the jigsaw into the right place. A few people had noticed that there was something on the underside of their jigsaw piece. Nevertheless, for most people it was a surprise when (with some trepidation that it might all fall apart) the jigsaw of comments was completely turned around to reveal a picture of St Benedict with his exhortation ‘Listen with the ear of your heart’. Mike Love introduces Mary Brennan and outline the “U” Theory of listening. Mary Brennan talks about the power of listening and introduces the video about going to Rome for Fratello. Table Groups adding key points from their discussions to their jigsaw piece. 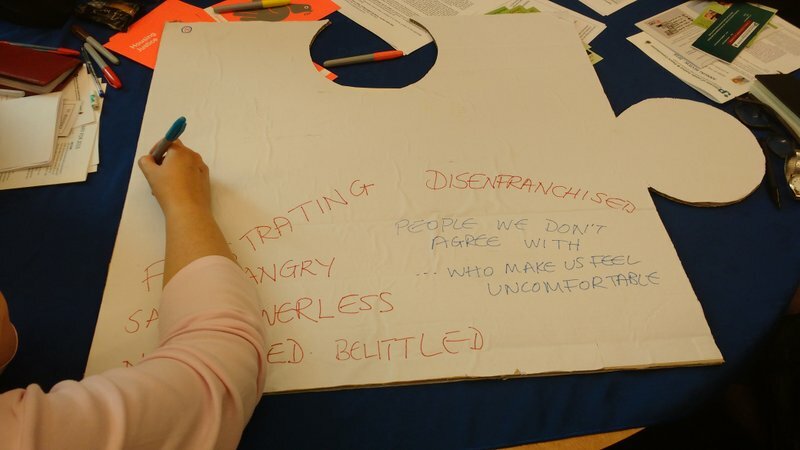 Liz Firth from Bradford talks to the main points brought out in her group’s discussion. 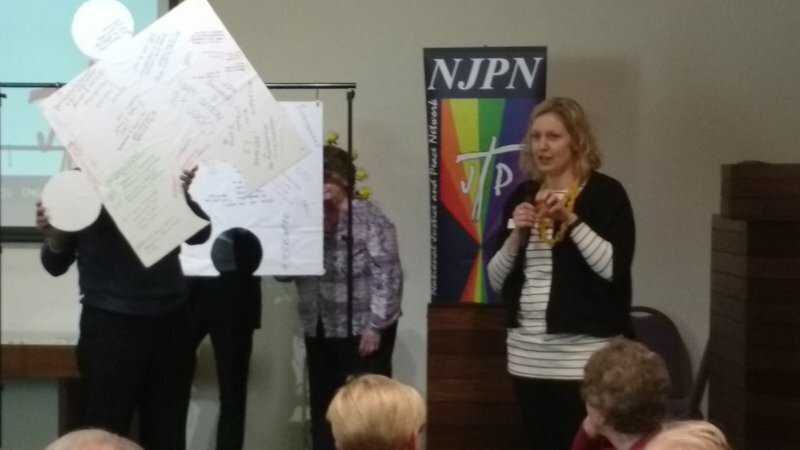 The jigsaw nears completion (in the background) as Mollie Somerville describes the main points brought out in her group. 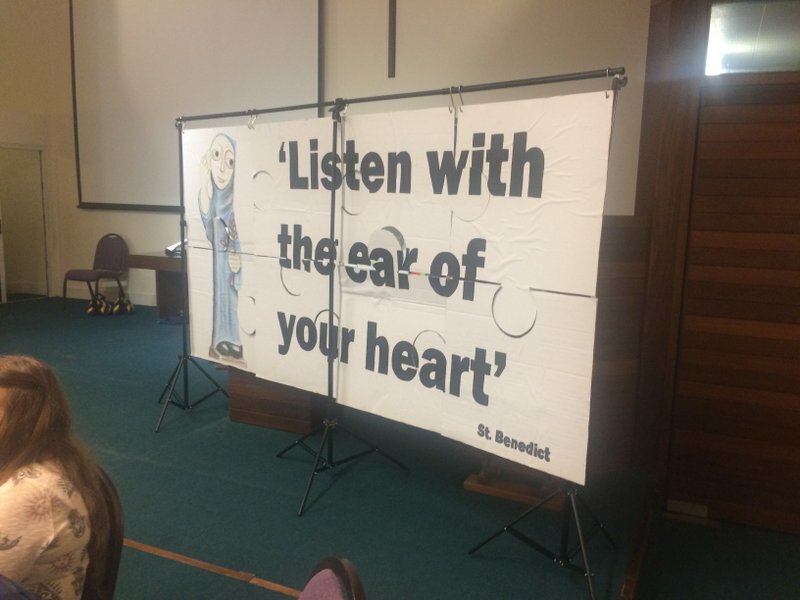 When the whole jigsaw was turned around it revealed another picture – of St Benedict and his exhortation to ‘Listen with the ear of your heart’. 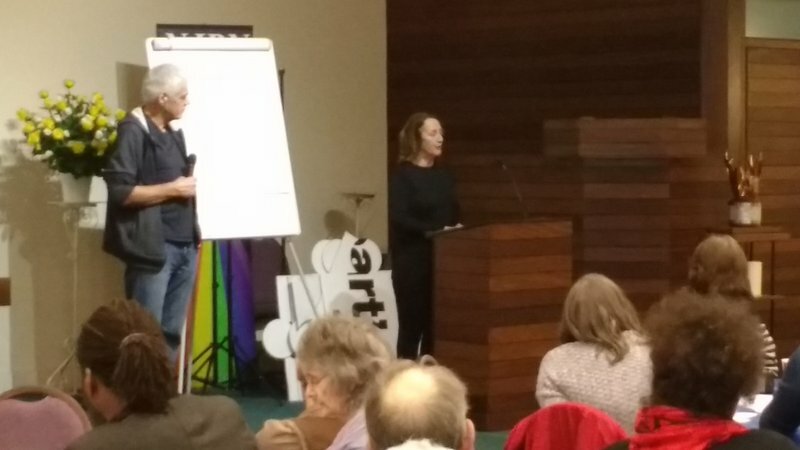 For people in the conference, listening with the ear of their heart enabled them to bring out the key points that were written on the back of St Benedit’s image. 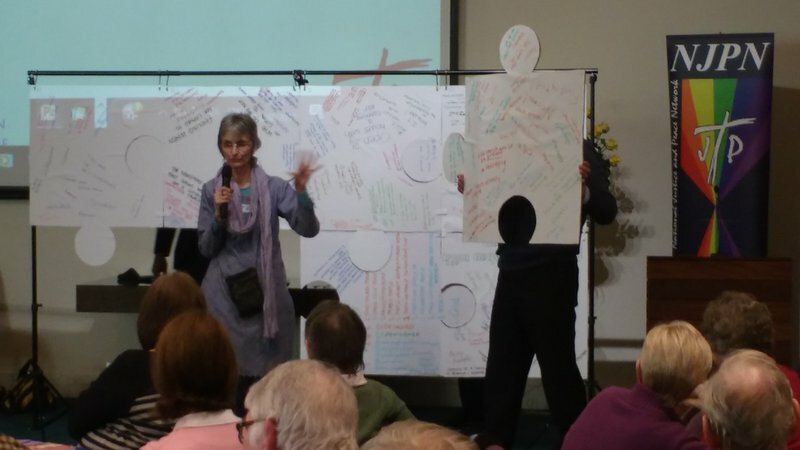 As part of the introductory part of the afternoon session we showed a short video made by the Leeds Poverty Truth Commission that included Mary Brennan, pictured in a couple of the photos above.